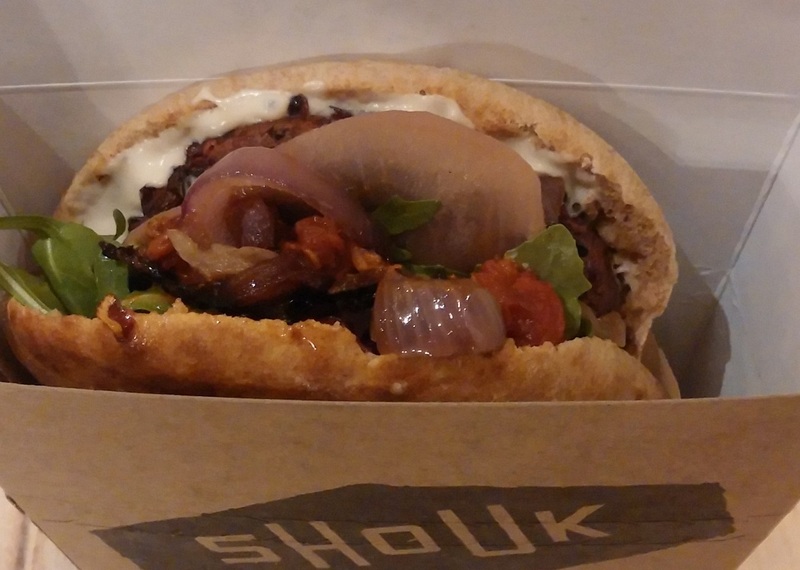 Shouk (pronounced “shook”), founded by Israeli-born Ran Nussbacher, is a 100% plant-based, Israeli fast casual pita restaurant in Washington, DC. Ran explains his “shouk” is a “modern-day eatery and market offering a new take on comfort food.” Ran was inspired by the fresh plant-based food at the shouk in his native Israel. 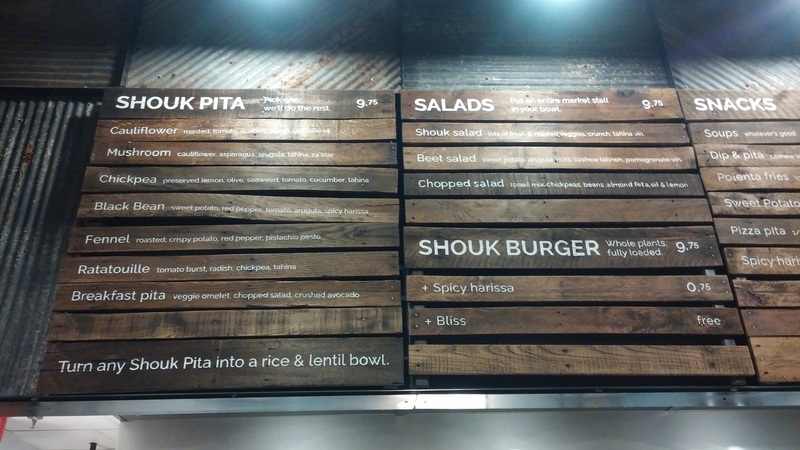 Shouk presents a sheek design although many of the new urban fast-casual places look similar with industrial, rustic ceilings and distressed wood walls. When I entered, I didn’t think they had any tables. They’re tucked away on a second floor. The tables are unusually long, perhaps an invitation to schmooze with strangers but they don’t leave much room for privacy. The space is small and could be better maximized. A good interior designer could fix the ergonomics. The manager recommended the Cauliflower ($9.75) with tomato, tahina, scallion, and parsley and the Shouk Burger ($9.75) which includes a tomato burst, pickled turnip, arugula, charred onion, and tahina. Both looked delicious but I opted for the Shouk Burger. There are also plenty of sides on which customers could nosh and they sell spices and spreads to go. The burger delivered on its looks. It was a generous and filling portion–a packed pocket of tasty veggies with a homemade crispy burger in a fresh pita. Props to Ran for making a burger from real food: chickpeas, lentils, and black beans. It’s stuffed into a well-sealed pita so it’s easy to eat without any mess. I was heartened to discover that meat-eaters are regulars, according to the manager. It’s the hallmark of an effective veg restaurant. Shouk even has an incentive for customers to bring a friend for a discount, evidence that they’re thinking critically and working on growing a loyal following. They have one location which opened approximately one year ago but they’re opening a second spot at the veg-friendly Union Market in February. It should thrive. The website is modern but a bit dark. It could use photos of customers happily eating their food. Hopefully they’ll lighten its mood once they get more settled. Now for some kvetching. Shouk delivers on the food but there is still work to be done on the customer experience. It would be unfair to judge the entirety of a restaurant’s service on one visit but every visit counts. In the book A Return to Love, author Marianne Williamson tells a story about a time when she felt like her life had no meaning. She was working in a bookstore and saw no value in it–until she decided to treat it as if it was her own. She started greeting customers as if they were friends, offered coffee, and added seats. She noticed more people started to return. Many of them told her they felt happy in the bookstore. Suddenly, she found purpose in her work. Every restaurant owner should adopt Williamson’s approach and they should train every employee to follow suit, especially in the ultra competitive food industry where it’s easy to gain a loyal following and just as easy to lose a customer forever. Restaurant teams always need to be prepared for media, food critics, and bloggers, and anyone else who may sustain or promote their business which includes everyone. The motto should be: We always go above and beyond. If I own a restaurant and people visit it to write a review, I want my team to call me so I can offer to speak with them on the phone if I’m not on site, make a connection, answer questions, and thank them for the visit and review. When I told the manager I was a vegan blogger and that I would be reviewing the restaurant, she was friendly, smiled, gladly answered my questions, and made recommendations but it ended after I ordered. It wasn’t busy so she could have checked to see if I liked the burger or offered samples if she had that flexibility. When I left, she simply thanked me. It was a missed opportunity to ensure everything passed muster. Many times people don’t realize that positive energy can make food taste better. Food brings people back but people bring people back too. This is an ingredient that vegan restaurants especially can’t afford to leave out given that they’re drawing from a smaller pool of customers. It’s not easy to find employees who will treat your restaurant as if it’s their own. But that should be the goal of every restaurant owner. And when it isn’t natural for employees, an owner should inculcate that passion through training and underscore the importance of every interaction and the consequences of falling short. Shouk’s food is satisfying and unique so it’s worth a visit. But I would not describe the ambiance as cozy and I retain higher hopes for the interactions their team has with customers. More awareness and engagement would go a long way. On behalf of farm animals, people’s health, and the planet, I’m rooting for them. I hope they go from very good to great.